The Dancing Word: Miriam and Mary — Here is the Bible - and two of its most important women -- Miriam and Mary -- made powerfully present with an expressive artistry to charge the imagination, soften the heart, and fire the soul with love. 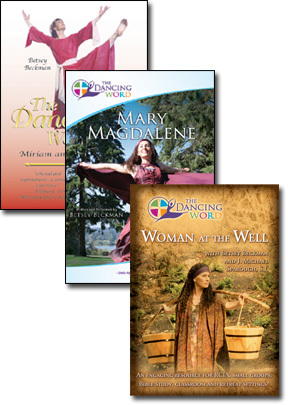 The Dancing Word: Mary Magdalene — This offering in The Dancing Word series offers an inspiring encounter with Mary Magdalene, whom we come to know as one of Jesus' most unique and intimate disciples. Filmed in the beauty of the Northwest, this scenic story offers dramatic visuals for the gospel and gives fresh voice to the oldest truths of our faith. One of North America's finest liturgical dancers, Betsey Beckman continues her ministry proclaiming the Word through drama and dance. She has developed a full repertory of Biblical StoryDances which she offers at church and conferences nationwide. The Dancing Word: Woman at the Well — A Samaritan woman approaches the village well and encounters a strange Jewish man. With the perfect balance of boldness and gentleness, humor and healing, Jesus gradually peels back layers of deceit and self-defense to reveal the woman’s true need. Soon it is Jesus who is offering spiritual water to a heart broken open. Giddy with joy, the woman returns to her village, bubbling over with Jesus’ life-giving water! The remarkable encounter is illuminated through this imaginative and poetic interpretation by John Shea.